This is the full text of the Barbara Martin’s article that appears in the December 2018 issue of The Volunteer v. 35, no. 4. First group of American Medical Bureau Volunteers. Freddie Martin stands center. While I never met Freddie in person, I corresponded with her from June 1981 until August 1987. I also spoke to her once shortly after an earthquake had hit Mexico City in 1985. Her voice was as strong and clear and though she had lived in Mexico since 1950, she retained her New York accent. She thought of herself as a New York City person. Shortly after my grandfather on the Martin side of my family died, I realized that I knew little about his family. His death marked the beginning of my genealogical quest. Coincidentally, Freddie had been doing some searching as well. I found out about her letter to my grandfather (Freddie’s first cousin) a few months after his death, and I began writing to Freddie to find out more about the Martin family. My part of the Martin family knew little about Freddie other than that she had written a book about seals- The Hunting of the Silver Fleece. My search for more information on my cousin Freddie has led me on a merry chase –from her letters, to contemporary newspaper articles, to her archives at the Tamiment Library/Robert F. Wagner Labor Archives and finally to books written by and about her. The Freddie I came to know was an independent person who had great courage, a wonderful sense of humor and a great love of family. She had a keen interest in current events, and felt a deep sense of responsibility for those less fortunate, fighting to right the wrongs she found. 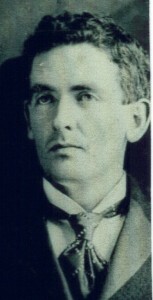 Frederick Alfred Martin in 1903, Barbara Martin collection. Freddie was born June 2, 1905, in Cooperstown NY, the daughter of Lydia C. Pennington and her husband Frederick Alfred Martin. She told me that she had some problems getting a copy of her birth record because there was a mix up in the clerk’s office. I had similar trouble obtaining a copy of her birth certificate. Her parents, Lydia and Frederick were married in June 1904 in Cooperstown, NY. Within six months, Freddie’s father had been killed in a horrible railroad accident leaving his young expectant wife alone. Fred had just begun a job working for the D & H railroad as a fireman. (His brother Edward and father in law Fred Pennington had worked for the D & H for many years.) In his 20s Fred had worked for a newspaper in New Haven, CT and was remembered as having a wonderful way with words. After the death of his first wife in 1893, Fred wandered about for several years before finally settling down with family in Cooperstown. In Cooperstown, he managed his brother’s gristmills, married and then went to work for the railroad. If a love of words is genetic, Freddie likely got her vocabulary from her father. Freddie was born in her Pennington grandparent’s home. She remembered it as a house constructed of beautifully carved stone. Her mother Lydia had established a very good relationship with Fred Martin’s family. She continued to maintain those relationships even after she remarried when Freddie was four. Freddie’s mother told her many stories about the Martin family and its unique relationship with religion. Fred Martin’s father, William was an Irish Protestant while his mother Alice was an Irish Catholic. Birth order determined religious assignment. The first child was Catholic, the second was Protestant and so on. Freddie thought that her father was raised as a Protestant. The stories about the family strife over religious differences may have been one of the things that piqued Freddie’s later interest in and tolerance for religious and cultural differences. Freddie circa 1906-1907, circa 1909, and Spring 1914, Barbara Martin Collection. Freddie’s stepfather George Wilbur had been a family friend and had also been widowed. George was 15 years older than Lydia and had a child only 5 years younger than Lydia. George and Lydia had one additional child, George Jr. Freddie remembered her stepfather George as a friend and the only Dad she ever knew. George Sr. was also a fireman for the D & H railroad. He died in 1925. Little information is available on George Jr. There is a record of a marriage at age 17 in Oneonta, NY. Freddie married Albert Shakes, a steward from Lowell, MA who was born in Greece. No further information was available about this marriage. Sometime after that, Freddie went to live and work with the St. Margaret Episcopalian Order of Nuns in Jersey City, New Jersey. According to one source, Freddie considered becoming a nun but instead she decided to become a nurse. In 1925 she began nursing school at the affiliated Christ Hospital in Jersey City. There were several nurses in the family. Freddie’s Aunt Alice (her father’s sister) and Freddie’s cousin Nellie were both nurses. Aunt Alice left her children with family to nurse her favorite brother Frederick, Freddie’s father, when he was very ill with Typhoid or Scarlet fever in about 1903. Freddie’s cousin Nellie became a nurse in 1904 and served in WWI with the American Expeditionary Forces in France. Nellie complained to the family that she had spent too much time during WWI serving doughnuts when she could have been healing wounds. Freddie described Nellie as short in stature (about 5’ compared to Freddie’s 5’ 8 3/4”) but exuding strength and character. She remembered Nellie as “an enemy of pain and illness and a comforter for all in need.” Freddie longed to be as strong and effective as Nellie. Nellie and Freddie usually got together once or twice a year to eat well done steaks cooked in butter at Shraft’s in New York City. Then they would go to movies or a Broadway show. After Freddie’s graduation, with honors, she worked at Bellevue, Fordham, Lying-In Hospital, and Crotona Park Hospital. In 1929, Freddie married Alexander Cohen. Alexander was born in England and was Jewish. While in New York City, they lived in a new coop apartment in Cooper Square in Manhattan. During the early 1930s, Freddie became involved in the nurse’s union and started participating in classes at the Labor Temple in NYC. The Labor Temple was sponsored by the Presbyterian church and it was a place where working people of all religions could express their thoughts. There she took classes in Russian and Yiddish. Freddie, like her cousin Rose Martin a Spanish Professor at Middlebury College, had an affinity for languages. Cousin Rose came to New York often to join Freddie and Nellie on their Shraft’s and show outings. Rose never married because the man she loved, a Protestant, refused to raise the children in the Catholic church. Rose’s father, Freddie’s Uncle Sam was one of the Martin children to be raised Catholic and passed along his religious loyalty on to his daughter. Freddie remembers Rose as being very loving to her daughter Tobyanne and thought that she would have been a wonderful mother. In April 1935 Freddie and Alexander took a trip to Europe and stayed for a time with Cohen’s parents in England before visiting Europe. During Freddie and Alexander’s trip through Europe in 1935, they spent time in Russia and Germany. That brief stay in Germany convinced her that the threat of the growing Fascist leadership was real. On her way home from England in October 1935, Italy invaded Ethiopia. Upon returning from Europe, Freddie and Alexander separated. Freddie called the eventual divorce amicable. When she returned from Europe, Freddie became active in the Medical Bureau to Aid Spanish Democracy. The group was formed to raise funds and gather supplies and equipment to assist the democratically elected republic, in Spain. At that time, Freddie was the night superintendent of the Crotona Hospital in NYC. Dr. Edward K Barsky, the head of the Medical Bureau recruited Freddie for her leadership and organizational skills. She was to be head nurse and administrator of the hospital division. Prior to leaving for Spain, Freddie had planned a fifty-bed hospital, helped to design uniforms, gathered and helped to pack supplies of all kinds. With a passport marked “Not Valid for Travel in Spain”, Freddie was one of the 17 people in uniform on the first ship bringing medical volunteers, supplies and ambulances to Spain via France. They departed on January 16, 1937. Nine additional groups would eventually bring aid to Spain. Upon arriving at their destination in Spain, the first job was to find a location for the hospital. 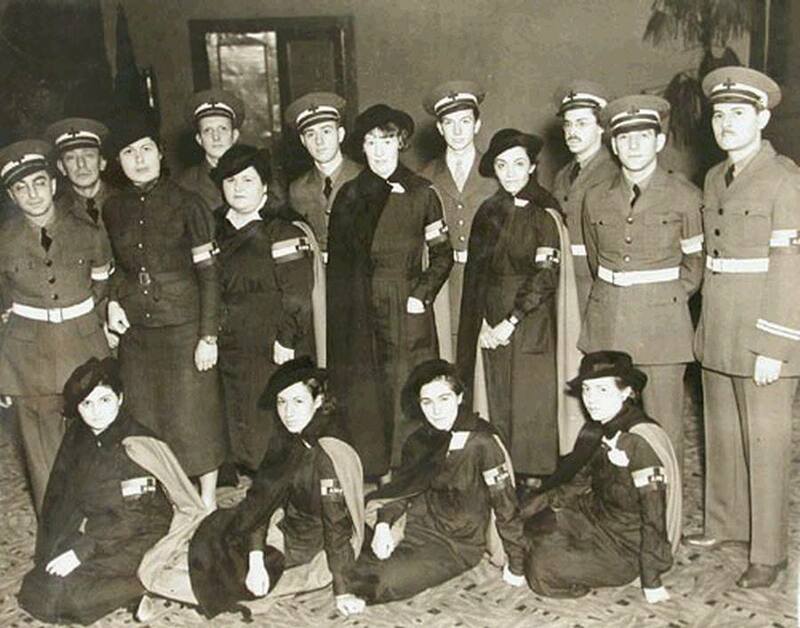 The first hospital, in a school house in El Romeral in the (Province of Toledo), opened on February 21, 1937 just in time to receive wounded from the bloody battle of Jarama. In mid-March, the volunteer group was asked to take over the management of three more buildings which had been serving as hospitals in Tarancon (Province of Cuenca). In the first part of April, the volunteers opened their own American Base Hospital in Villa Paz. The hospital was located in a rustic summer home of the Infanta Paz, the daughter of Queen Isabella II and her husband Francisco of Spain. The building had rudimentary plumbing and was fully furnished, complete with paintings on the wall. The hospitals were always under equipped and short staffed. Freddie worked to train local Spanish women as assistants. Eventually there were 400 local girls who became efficient nurses. The hospitals cared for both military and civilian patients. Civilians were treated for wounds but also for any other medical needs. Iodine and alcohol were in short supply and sterilization of surgical instruments was a challenge. When the soap ran out, they made soap. When there were no kitchens in the hospitals, cooking was done over open fires. By the end of 1937, Freddie had organized between six and nine hospitals (sources vary), and worked with Dr. Barsky and others to set up two mobile operating units which went to the front. Her small black workbooks are filled with details of the supplies needed and the work that she and the staff completed. The work was harrowing, stressful and often heartbreaking, the hours were long, and the triage units they operated would have to move over and over again. It was inevitable that feelings would be hurt, or staff would feel unappreciated and Head Nurse Fredericka would have to intervene and try to soothe feelings or solve problems like who would be assigned to burn the dead bodies. Freddie supervised and encouraged the nurses, “her girls”. She gained the name of “Ma” for the way she treated both the staff and the patients. She told interviewers stories of doling out chocolates and small pieces of fruit cake to the staff to give everyone something to look forward to, supplementing what she called spartan meals—sometimes of mule flesh and sparrows. Freddie also told an interviewer that the nurses always used make up so that they would look their best to cheer up the patients. In late January 1938, Freddie left Cherbourg to return to the US to raise funds for the 120 or so American medical volunteers still in Spain. The funds raised and supplies obtained were shared with other medical volunteer groups. Her fundraising tour took her across the country. In some places she was on the same billing as the famous writer and satirist Dorothy Parker. In Freddie’s speeches and interviews with the media she told of the bombings of the hospitals and the close calls she had endured. She proudly told of securing the wounded in the cellar in a record seven minutes just before bombs hit during the terrible raid in December of 1937. That raid destroyed two of the three hospital buildings. Freddie had rushed out just prior to the raid to douse a fiery line which had been set to point to one of the hospital buildings. She managed to put out the flames just before a bomb hit nearby. The next day she found some large rocks which had just missed hitting her. During her fundraising tour Freddie told a Seattle Times reporter that she no longer liked moonlight as moonlight would allow the enemy bombers to see the hospitals. Hospital staff had to douse the lights when the first alarm of enemy planes was sounded–surgery would continue with a flashlight over the operating table. Freddie says, in her biographical notes for her book on the Medical Bureau, that the Americans who she met on that fundraising tour made her proud she was happy “…that the accident of birth made me a member of such a nation.” In February 1939, Freddie enrolled in NY University for Hospital Administration but by April 1939 her reputation for hospital organization led her to Greenbelt, MD. Freddie was asked by federal officials to convert one of the newly built attached houses into a medical facility. Greenbelt, was the first planned community under the auspices of the federal government. It was planned as housing for federal workers and was a project meant to put people back to work during the midst of the Depression. This is where she met Dr. Samuel Berenberg. Dr. Berenberg was Director of Public Health in Greenbelt. They were married in 1940. Freddie and Sam were not to settle long in Greenbelt. Freddie said that she was sitting in their garden on a scorching late May afternoon in 1941 when Sam got the call from the Department of the Interior, Fish and Wildlife Service asking him if he would be interested in providing medical services on an island in the Bering Sea. Dr. Samuel Righter Berenberg, was a well-read intellectual who was described in his medical college yearbook as being as interested in psychology as medicine. In an obituary, Sam Berenberg was described as an idealist and one who did not compromise his principles. Dr. Berenberg and his new wife Freddie were well suited to begin this new adventure. Freddie relates in her first book, Hunting the Silver Fleece, that living amongst the Aleuts was irresistible compared to their pastime of searching for artifacts of long dead Native Americans on the Maryland shore. Freddie, a consummate researcher, could find much information about the flora and fauna but little about the people on the Bering Islands. The Interior Department advised them that the temperature would be similar to a Washington DC winter and that they would see sea lions, seals, blue foxes, reindeer, sea birds and a myriad of wildflowers. As nature lovers, the Berenbergs were hooked. So, four days after receiving the call, Dr. Sam Berenberg took a year’s leave of absence from his job and left the very hot weather of Maryland for the Bering Sea. In about two weeks, Freddie and Sam were on the Penguin, the Department of Interior’s transport to St. Paul Island with 300 well-loved books, a layette for the baby who would be born on August 29th, a typewriter, and a few pieces of colored antique glass. Based on tips from people in the know, they picked up some raincoats in Seattle just in time to catch the boat. The clothes that they brought from Greenbelt would not do for the subfreezing temperatures of the islands in the Bering Sea. They borrowed warmer garments from the large number of clothes left by the Army during the last war. Freddie said that “As a confirmed disciple of the slacks cult, I had no objection to facing the wintry blasts in heavy masculine clothing.” Pictures of Freddie from that time, demonstrate her slacks and other types of men’s clothes. Freddie and Sam arrived on St. Paul on June 25, 1941. Both Freddie and Sam had an insatiable curiosity. They could hardly wait to explore the island and its treasures. Thus began nearly a year on St. Paul Island where both Berenbergs explored their surroundings and did what they could to chronicle and ameliorate the plight of the Aleut people living and working on the island. The official opinion of the Aleuts living on St, Paul was far from complimentary. The Aleuts were considered to be dirty, lazy, uneducated people. Official society in St. Paul did not associate with such people. Sam and Freddie’s desire to get to know the local people was not looked upon with favor. Freddie and Sam’s year on St. Paul Island was brought to an early end by the impending Japanese invasion which began with the bombing of Dutch Harbor in early June 1942. The St. Paul residents had been closely monitoring the progress of the war as the Japanese had a long history with the fur seal and with the Aleutians. Freddie lamented that “Seeking a respite from the clamorous world for a year, we had settled too close to the dragon’s tail.” On December 31, 1941 Freddie wrote in her diary that she wished that she could “shake off this feeling that the Japanese will take over the island that that we will have not chance to get off ahead of them. The last war hurt me enough. Yet psychologically I was very safe in that war. I have no psychological armor now that I am a mother.” She remembered the Spanish women wailing over their dead children. The Navy finally evacuated St. Paul Island on July 14, 1942. Freddie and Tobyanne sailed for Seattle and home. Sam stayed on in Alaska until the end of his tour of duty. Freddie’s experiences on St. Paul Island provided Freddie with projects which would influence the rest of her very active life. Alexandra Gromoff, teenage daughter of one of the important Aleut families, accompanied the Berenbergs back to the States. Alexandra lived with the Berenbergs in New York and attended college there. Early during her time on St. Paul Island Freddie strove to learn more about the Aleut people and their language. Freddie had corresponded with R. H. Geoghegan who was creating a dictionary of the Aleut language. Geoghegan rewarded Freddie’s interest in the Aleut language with “bursting envelopes” of information. A friendship developed which led to Freddie’s editing of Geoghegan’s dictionary which was published in 1946. Freddie and Sam Berenberg divorced in 1950. Sam remarried later that year. In her first letter to me, Freddie explained that she took 9-year-old Tobyanne on a yearlong trip to Mexico to reorient life after a divorce. She said that she and Tobyanne liked Mexico so much that they stayed. There was more behind that move however. 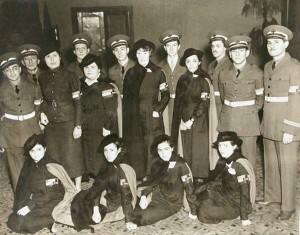 During the 1950s the members of the Medical Brigade came under scrutiny because they had been or had worked alongside the Communists during the Spanish Civil War. Dr. Barsky lost his medical license and spent time in prison for not cooperating with the Congressional investigations. Because of her time in Spain and because she had become such a strong advocate of the Aleut people of the Pribilofs, Freddie was also a target. Before Freddie and Tobyanne left for Mexico and during return visits, Freddie was visited by the FBI. Freddie’s indignation over the “Red Scare” was clear in her letters to me. 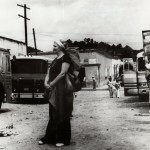 Freddie waiting for the bus in Taxiaco, Oaxaca, Mexico, 1980, Barbara Martin collection. she updated her book The Hunting of the Silver Fleece calling it Sea Bears: The Story of the Fur Seal. She contributed to tour books and created a book of conversational Spanish. 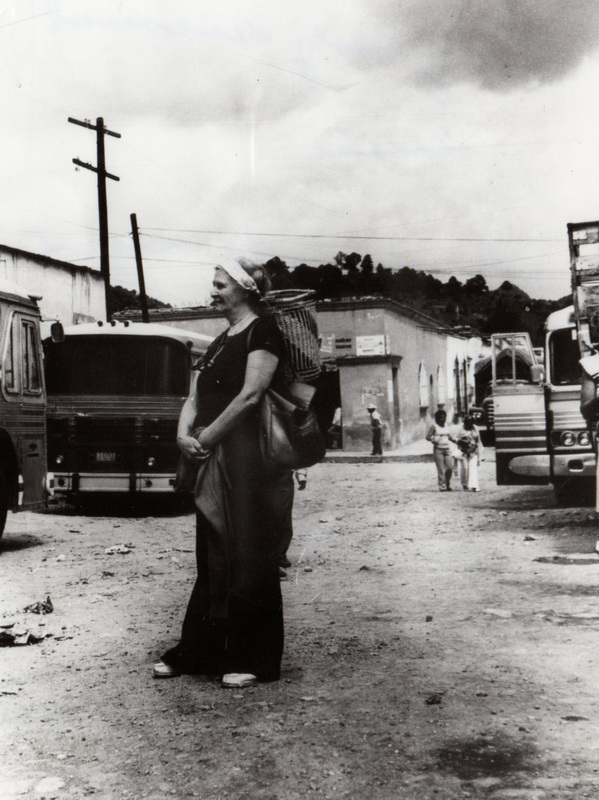 Her books and her translation work helped to pay her bills, this was especially important after her American dollars became Mexican pesos during the Mexican financial crisis in the early 1980s. Freddie continued to correspond with and campaign for her Aleut friends. Freddie also began to collect information for a book on the Medical Brigade in the Spanish Civil War. Freddie believed that there was a need for books about American volunteers. Freddie returned to the US periodically to visit her mother and other friends and relatives. Among her stateside friends were Toby Jensky and Anne Taft, nurses who worked with Freddie during the Spanish Civil War. Tobyanne was named after these dear friends. Freddie’s mother Lydia died in 1959, just as Freddie was planning to bring her mother to Mexico. Freddie’s efforts with the Aleuts led to a grant to research the historical records of the Spanish exploration of Alaska. To do the research, Freddie traveled to Spain in 1972. This trip allowed her to revisit hospital locations used during her time with the Medical Brigade. Her dream was to document the many contributions of this valiant group of people. She drafted a journal describing her experiences and her memories. In 1985 Freddie told me that she was still applying for scholarship grants to travel to Salamanca, Spain to research information on the Medical Brigade. Freddie (second from left) with friends on her 79th Birthday in 1984, and Freddie with daughter Tobyanne in 1979, Barbara Martin Collection. In 1986, Freddie became one of seven people awarded honorary doctorates from the University of Alaska. The University of Alaska choses awardees based on their leadership roles in the governmental, humanitarian and scientific worlds, both Alaskans and non-Alaskans have been selected for this distinguished honor. During the time I corresponded with Freddie, I found her to be a clever, intelligent, curious, and fiercely loyal person. She was very proud of her daughter and her grandson and their accomplishments. Despite her limited means, she was generous with the rest of her extended family. She went out of her way to provide my family with pictures of our ancestors and she was so thrilled with the birth of my daughter that she sent her a beautiful Mexican dress. In her final years, Freddie valiantly struggled with finding a home with reasonable rents, space to house her collection of materials on Spain and Alaska, clerical help to type her many letters to continue her advocacy work and correspondence with friends and family. She also struggled against her infirmities. In an early letter to me, she complained that osteoarthritis and tenosynovitis limited her efforts to write, later she said that she was “running carelessly through the street I stepped on something mobile which tossed me up.” The fall kept her from working and walking for several months. Freddie’s archives on the Medical Brigade are housed in the Tamiment Library/Robert F. Wagner Labor Archives. Freddie’s archives on her work with the Aleut people can be found at the University of Alaska. FREDERICKA I. MARTIN, June 2, 1905-October 4, 1992, An Internationalist who fought for peace in the Spanish Civil War and for the rights of the Aleut People of the Pribilof Islands. From what that I know about my cousin and what I have learned from my conversations with her daughter Tobyanne, Freddie would have thought this a fitting tribute. Fredericka Martin to Barbara Martin, Barbara Martin’s collection of letters from. June 1981 to August 1987 (Hereafter FM to Martin), September 16, 1981 and undated letter from October 1981. IBID., July 7, 1981 and January 14, 1982. FM to Martin, July 7, 1981. New York, County Marriages, 1847-1849; 1907-1936, Otsego County, Ancestry.com. 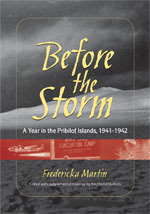 Fredericka Martin edited and supplemented by Raymond Hudson, Before the Storm: A Year in the Pribilof Islands, 1941-1942, (Fairbanks: University of Alaska Press, 2010), ix. FM to Martin, September 16, 1981. Martin, Before the Storm, ix. New York, Passenger Lists, 1820-1957 for Fredericka Cohen October 11, 1935.Ancestry.com. Ashley Johnson, Healing the Wounds of Fascism: the American Medical Brigade and the Spanish Civil War, an undergraduate thesis Mount Holyoke College, 2007, 16. Biographical Materials written by Fredericka Martin to prepare for her book on the Medical Bureau, undated, Fredericka Martin Papers; ALBA 001; box 24; folder 9; Tamiment Library/Robert F. Wagner Labor Archives, New York University (hereafter Biographical Materials). Historical Biographical Note, Fredericka Martin Papers; ALBA 001; Tamiment Library/Robert F. Wagner Labor Archives, New York University courtesy of the Tamiment Library/Robert F. Wagner Labor Archives. Johnson, Healing the Wounds of Fascism, 16. Wikipedia sources on Villa Paz and Infanta Paz. “Nurse Tells Horrors of Spain War Work,” San Francisco Chronicle, February 16, 1938, p. 3. “Soap Big Worry Not Bombs, Nurse Here Tells of Spain,” Seattle Daily Times, February 6, 1938, 15. “Nurse Tells Horrors of Spain War Work,” San Francisco Chronicle, February 16, 1938, 3.; Janet Willen and Marjorie Gann, Speak A Word For Freedom, Women Against Slavery, (Canada and the US: Tundra Books, 2015), 121. Fredericka Martin’s Small Black Workbooks, February 1937-July 1937, Fredericka Martin Papers; ALBA 001; box 10; folder 12; Tamiment Library/Robert F. Wagner Labor Archives, New York University. Johnson, Healing the Wounds of Fascism, 56, 65, 68. Materials associated with the 40th Anniversary Banquet for the Bay Area Post of the Veterans of the Abraham Lincoln Brigade in February 1977, Fredericka Martin Papers; ALBA 001; box 29; folder 35; Tamiment Library/Robert F. Wagner Labor Archives, New York University; “Seven American Nurses Survive,” New York Times, February 6, 1938 clipping; Madrid 1937, Cary Nelson and Jefferson Hendricks, Letters of the Abraham Lincoln Brigade from the Spanish Civil War, (NYC: Routledge, 1996), 258. “Seven American Nurses Survive,” New York Times, February 6, 1938. Jill Parsons St. John and Megan Searing Young, Images of America, Greenbelt, on behalf of the Friends of Greenbelt Museum, Arcadia Publishing, 2011, 7-8. Willen and Gann, Speak A Word For Freedom, 121. Martin, Before the Storm, 2. Ariel Yearbook, University of Vermont (Burlington VT:1935), 172. Dr. Myron E Wegman, “Samuel Righter Berenberg”, American Public Health Association, Association News, Volume # 73, No.12, December 1983, 1407. Fredericka Martin The Hunting of the Silver Fleece, Epic of the Fur Seal, (New York: Greenberg Publisher, 1946), xvi and xvii. Martin, The Hunting of the Silver Fleece, xvii. Martin, Before the Storm, 2, 55. IBID., 80,124,198, and rear cover. Speak A Word For Freedom, 119-120. Martin, Before the Storm, 224. Conversations with Tobyanne Berenberg Martin, December 2017. Martin, Before the Storm, 317. FM to Martin, Undated letter from October 1981. FM to Martin, June 19, 1981. Fredericka Martin, Sea Bears, The Story of the Fur Seal, (Philadelphia: Chilton Company, 1960), vii-ix. Willen and Gann, Speak A Word For Freedom, 126.; FM to Martin, January 11, 1985. FM to Martin, April 9, 1983. Fredericka Martin, Return to Spain 1972, Unpublished journal, 1972, Fredericka Martin Papers; ALBA 001; box 10; folder 11; Tamiment Library/Robert F. Wagner Labor Archives, New York University. FM to Martin, January 17, 1985. FM to Martin, March 10, 1986. IBID., July 7, 1981 and July 12, 1985. Willen and Gann, Speak A Word For Freedom, 127.